Welcome to the most fundamental and important aspect of playing: How to hold an ‘ukulele. What’s the worst thing that could happen if you do it wrong? Well, you just might be hampered in everything you try to learn…! But don’t worry – it’s not that hard! All directions here can be reversed if you are a lefty. Hold the ‘ukulele against your chest with your right forearm across the top edge of the lower bout. Your strumming finger should be able to comfortably reach almost to where the neck meets the body. This is the best place to strum. If you try and strum the strings closer to the bridge, it gets harder to move the strings and the sound isn’t as nice. If you have one of the bigger-sized ‘ukuleles, you might want to place it on your leg when sitting. When standing, the friction of your (bare) arm across the soundboard should be enough (with minimal help from your fretting hand) to keep the instrument under control and not fall onto the floor. Here’s how to hold an ‘ukulele with your left hand. Put the pad of your thumb on the top half of the back of the neck somewhere between the nut and third fret. Try to avoid wrapping your thumb over the top of the neck as this restricts your movement. Your wrist should stay fairly level (in line with your arm) unless you need to twist sideways a bit to reach a chord like G7. You also might need to bend your wrist down and away from you to reach the higher strings. Depending on the chord, you can rest the neck on the base of your index finger. Your fretting fingers should be close (give or take 10-15 degrees) to parallel with the frets. It helps a lot if you trim your fingernails short on this hand. Otherwise your nails will be holding the pad of your finger off the fretboard. 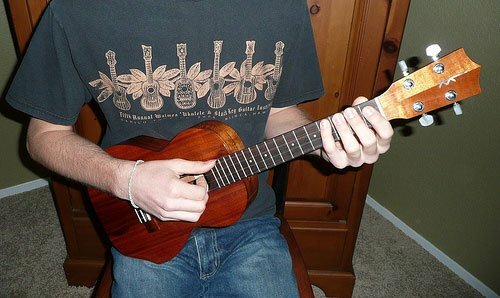 Keep your elbow a couple inches away from your side as you hold the ‘ukulele. If you were to draw an imaginary line from your shoulder to your fretting hand, you’d want your elbow along the line. Hold an ‘ukulele in a relaxed manner. Keep your thumb behind the neck. Keep the ‘ukulele upright and against your chest/belly. Keep your fingers relatively parallel to the frets – unless you are playing a chord that requires you to turn your wrist. Let the ‘ukulele slide flat onto your lap. This makes things much, much harder for your wrist. Squeeze the ‘ukulele to death. Find the happy medium that supports the instrument but also lets you relax. Hold your elbow way out. Hold your elbow tucked all the way in or in front of you. If it feels more awkward than it should, it probably is. Find a mirror and try to troubleshot how you’re holding the ‘ukulele by examining yourself and relaxing your posture as best you can. To make sure you’ve got it – and to make sure you keep the feel in your body – you should actually apply this knowledge in one of the easy ‘ukulele songs you can find here. Everything you learn needs to be applied in real music. Otherwise it won’t have any relevancy to your ‘ukulele playing. Most people play the ‘ukulele right handed, using their right hand to strum. There are a few who feel it is more comfortable to play left handed and strum with their left hand. There is no “best” way. I write left handed and I play right handed – I don’t know why, it’s just what feels comfortable and I never even considered playing the other way. If you are torn about what way to play I would recommend trying to hole the ‘ukulele right handed first. It will be easier to learn since 99.9% of all materials are for the right handed player. Take the strings off and put them on backwards (G string closest to your face). This mirrors a right handed ‘ukulele. You will have to decide what is right for you, but the former is going to give you the ability to pick up any ‘ukulele and play it. This in itself is a huge reason to learn “upside down.” You don’t want to be stuck needing a specially tuned instrument to play. But the ‘ukulele is strung the way it is for a reason and it’s nice to have the lower notes higher up on the fretboard. Here’s a more in-depth exploration of left handed playing and options from Baz Maz over on Got a Ukulele. How to make your strumming hand as graceful as possible. A strap does most of the holding for you! They can be especially useful when standing up.